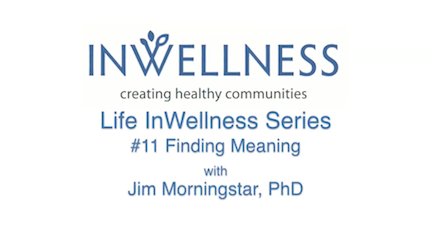 In this excerpt from LIWS #11 Finding Meaning, Jim Morningstar, PhD, shares how Finding Your Purpose can make an all important difference in your daily life satisfaction as well as be invaluable when it comes time to make major life decisions. Join Jim in a simple exercise to help you make a heart felt description of your life purpose. For the complete Finding Meaning class (48 minutes for $9) or the 12 Class Life InWellness Series click on buttons. What are your signature strengths and how do you find them? In this excerpt from Life InWellness Series Class #11: Finding Meaning, Jim Morningstar, PhD, helps us explore the talents that stand out, make us unique and promote satisfaction in our life and work. Make note of those that resonate most wth you and learn to build them more prominently into your life. Click below for the complete class on Finding Meaning (48 min. 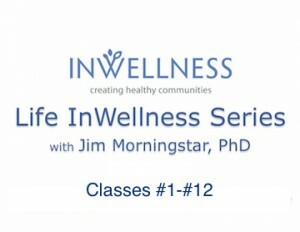 for $9) or the 12 Class Life InWellness Series. Jim Morningstar. PhD, gives incisive tips on how to live in the present moment and dramatically increase the joy in your day to day life. This is an excerpt from his Life InWellness series #11: Finding Meaning, one of a series of 12 video classes on health and wellbeing available to all interested in taking primary responsibility for their happiness and fulfillment. For the complete Finding Meaning class (48 minutes for $9) or the 12 Class Life InWellness Series click on buttons. 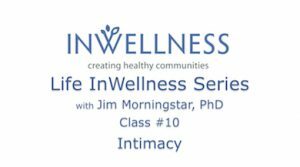 In this excerpt from Life InWellness Series Class #11: Finding Meaning, Jim Morningstar, PhD, presents practices of Gratitude which transform not only your mental states to greater harmony, but have a positive impact on your health and wellbeing. These practices are simple and powerful when taken to heart. For the complete class on Finding Meaning or the 12 class Life InWellness Series click below.